Make bigger waves within your community and with your clients. Want to strengthen partnerships within your network of business and nonprofit influencers? 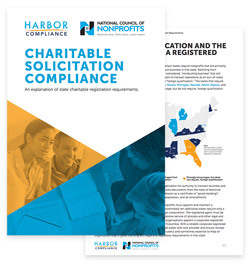 Consider partnering with Harbor Compliance to elevate your relationships with customers and donors! We offer three partnership options: content, referral, and custom. Show your influencers that you are dedicated to seeing them succeed by partnering with one of the industry’s leading compliance solution providers. In addition to our services and technology, your audience and clients have access to more than 3,000 educational content resources. Decide which partnership option is right for your organization. Get to know us, or browse our Information Center to get a glimpse of the resources available to you. As a referral partner, gain financial support for clients that engage with us. It’s a win-win-win: your clients are compliant, you receive compensation, and we further our mission of providing outstanding compliance solutions. Whether you are an attorney, accountant, consultant, or other professional, you can expand your business by leveraging our specialized expertise and technology. Contact us to share your objectives and we’ll work together to create a successful partnership.